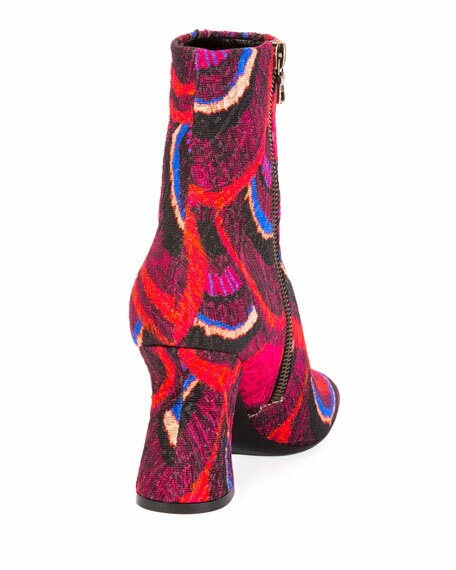 Dries Van Noten printed brocade bootie. Alexander Wang calf suede/stretch fabric ankle boots. 1.5" stacked heel with signature metal tilt-effect plate. 5"H shaft, 9" circumference. Almond toe. Tonal topstitching. Gored side insets for fit. Looped backstay eases pull-on style. Rubber outsole. "Kori" is imported. Italeau waterproof suede ankle booties. 1" chunky flat heel. Round toe. Double side zips ease dress. Waterproof & stain resistant. Italeau waterproof suede ankle booties. 1" chunky flat heel. Round toe. Double side zips ease dress. Waterproof & stain resistant. Leather sole covered with rubber for grip. Removable memory foam insole with arch support. Leather lining. Crepe rubber sole. "Foliana" is made in Italy.